A portion of the Strava Labs heat map from Kandahar Airfield in Afghanistan, made by tracking activities. BEIRUT — The US military said Monday that it is adjusting guidelines for the use of all wireless and technological devices on military facilities amid revelations that fitness trackers can be used to expose the identities of individuals working in sensitive and hazardous locations. The review came after reports that a global heat map posted online by the fitness-tracking company Strava reveals the outlines of US military bases in some of the most dangerous locations in the world, along with the routes taken by supply convoys and patrols. On one of the Strava sites, it is possible to click on a frequently used jogging route and see who runs the route and at what times. 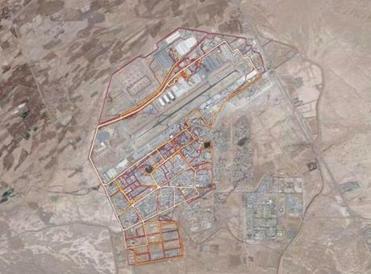 One Strava user demonstrated how to use the map and Google to identify by name a US Army major and his running route at a base in Afghanistan. Could soldiers’ jogging tip off the Taliban? An interactive map could tip off enemies about the location and activities of soldiers at US military bases. The US military said in an e-mail that new technologies pose challenges that are constantly being reviewed. ‘‘The rapid development of new and innovative information technologies enhances the quality of our lives but also poses potential challenges to operational security and force protection. We constantly refine policies and procedures to address such challenges,’’ said the Central Command press office in Kuwait, which speaks for the US-led coalition against the Islamic State. Some of the most readily identifiable bases exposed by the Strava data are in remote locations in Syria and Iraq, where US forces are battling the Islamic State. The existing rules on the privacy settings relating to devices such as fitness trackers are being ‘‘refined’’ and commanders at bases are being urged to enforce existing rules governing their use, the statement added. Strava issued a statement saying that it takes the safety of its users seriously. The company ‘‘is committed to working with military and government officials to address sensitive areas that might appear,’’ the statement said. Strava had originally responded to the allegations by saying that users should check their privacy settings. The public availability of the data represents ‘‘a potential catastrophe,’’ said Nathaniel Raymond, director of the Signal Program on Human Security and Technology at the Harvard School of Public Health. He researches the use of data technology for humanitarian workers around the world and said he has been warning for years of the dangers of the GPS data that is gathered and stored by companies such as Strava. He said he used the map to pinpoint the jogging route he used to take when he served with UN peacekeepers in South Sudan in 2015. The route is evidently still being used by peacekeepers deployed there. Since Sunday, he and his team have used the other Strava sites to identify the names and daily routines of eight foreigners working for aid agencies and the United Nations in the Somali capital Mogadishu, one of the most dangerous cities in the world. ‘‘The focus of this story has been soldiers and spies, but we are also talking about humanitarian workers. If you look at what we saw in Mogadishu and you are Al Shabab, you get a pretty good idea of who the foreigners are and where they are working,’’ he said, referring to the name of the Al Qaeda affiliate in Somalia. The realization that the data posted by Strava contained sensitive information was made by chance by an Australian undergraduate student, Nathan Ruser, who used the company’s publicly available map to identify the perimeters of US military bases in places such as northeast Syria. At one of the sites of a US-led coalition base, it is possible to see that personnel regularly run along the top of a nearby dam.